Imagine your neighbourhood without any trees. It would look pretty dismal, more like an industrial area than a residential neighbourhood. Trees are an important part of our lives, offering us a sense of place within our community and providing us with many benefits on a daily basis. Trees can provide us with a shady place to have a picnic on a hot summer day, a quiet location for a walk along the river or perhaps a serene setting to read a good book. But trees have many practical uses as well, especially for those of us living within a city, where they can reduce noise from busy streets, increase privacy in backyards and keep houses cool in the summer. We don’t often realize that the trees growing within our neighbourhood are saving us lots of money. Planting trees is really like making a long-term investment. The benefits of trees extend far beyond their ability to provide shade and privacy. We derive economic benefits from trees in many ways and not just in terms of forestry resources such as lumber and timber products. Trees are able to reduce the amount of money that we spend on treating and managing our water supply, heating and cooling our homes, combating air pollution and producing energy. Trees are especially important in an urban setting where they are needed to maintain a healthy environment by cleaning the air and water, and counteracting the effects of urban growth. Cities spend a lot of money installing storm water management facilities and, through the Grand River Conservation Authority, managing flood control systems. 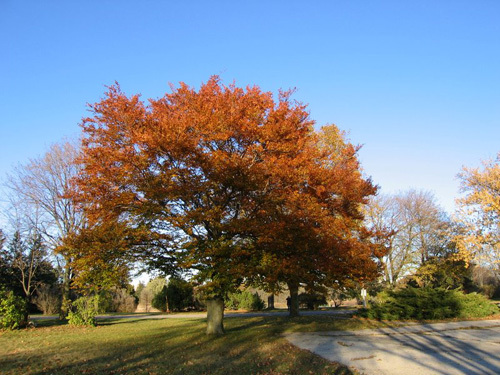 Trees can offset these costs by intercepting rainwater and reducing the amount of runoff that must be managed in the urban area and by storm water management facilities. A study in Charlottesville, Virginia showed that when tree cover dropped eight per cent between 1976 and 2000, the amount of runoff increased by 19 per cent. It would cost about US$6 billion to build storm water retention ponds and other engineered systems to intercept the runoff that had previously been captured by the trees. The study also reported that the city’s tree cover captured an estimated 7,200 tonnes of carbon per year and removed close to 104,300 tonnes of pollutants from the atmosphere. The dollar value placed on these services was estimated to be US$567 million. The Grand River watershed is about one-third the size of the Charlottesville study area, however, similar results could be expected based on population size and density of the Grand River watershed as a whole. The urban core and other parts of a city where tree cover is scarce are often referred to as “heat islands.” These are areas where air temperatures are often much higher than the surrounding area, sometimes by as much as 3C to 5C. Higher temperatures in urban heat islands bring with them increased energy use, mostly due to a greater demand for air conditioning. As power plants burn more fossil fuels, they increase both pollution levels and energy costs. Wintertime also brings on higher heating costs in areas with low tree cover due to the cooling effects of the wind and weather on an exposed building. Planting trees strategically at various locations around an otherwise exposed building can reduce heating and cooling costs by as much as 40 percent. Trees are most effective in reducing cooling costs when they shade air conditioners, windows or walls, and when located on the side of the home receiving the most sun. Windbreaks on the north side of a house are most effective in the winter for blocking cold northerly winds. Over their lifetimes, trees can be much less expensive than air conditioners and heating systems, and the energy needed to run them. (More information is available on the Vancouver-Clark Washington Parks and Recreation website. So we know that trees can save us money, but how do they make us money? Trees create a pleasant environment. They create a sense of place and provide us with a sense of security. They even make us want to shop! A study conducted in Vancouver-Clark, Washington showed that people shopping in a treed business district were inclined to shop more often, for longer periods of time, and to spend in the range of 11 percent more for the same product than if it was sold in a treeless business district. This shows great promise for small businesses located in well-established neighbourhoods where the tree canopy is fully developed and mature trees line the city streets. Trees help raise real estate prices. The homes located on a well-treed street are often priced higher than a comparable home located in a relatively treeless neighbourhood. Urban foresters and real estate agents have found that trees increase the real estate value of both residential and commercial property. American Forests estimates that a well-landscaped home and mature trees will increase the value of the property by 15 percent. That is an additional $22,500 on a home valued at $150,000. 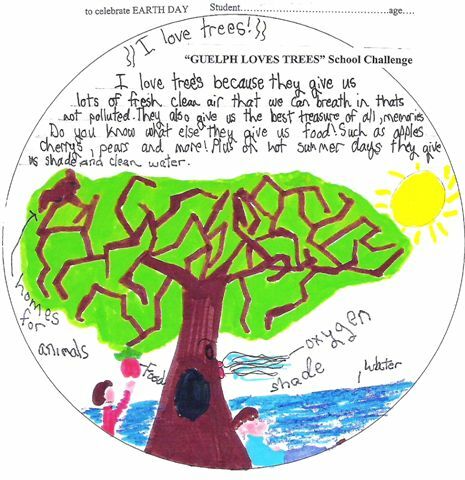 There is no question that trees add value and benefit to our everyday lives. But there is also financial incentive involved in planting trees that will help keep money in your own pocket and help to maintain the health of our environment for the long term. 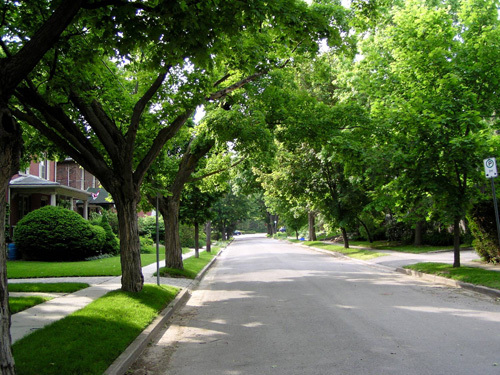 American Forests, a not-for-profit organization involved in assessing the value of tree cover on the landscape, recommends that tree leaves should cover 40 per cent of the area within a city. This minimum area would ensure the sustainability of the urban ecosystem and maintain a balance between urban growth and a healthy environment. The urban centres in the Grand River watershed vary from a low of 24 per cent in Brantford to a high of 29 per cent in Waterloo. The goal of 40 per cent is attainable and can be accomplished through community effort and dedication. There are currently numerous groups committed to reaching this goal in the Grand River watershed and they have already achieved significant results, but every effort made is a step in the right direction. So in the end, take a moment to plant a tree, save some money and make an investment into the future of your community. Watershed Forest report 2004 (Guelph canopy is 27% : Source GRCA).